Carat is the unit weight of a diamond and is the most visual of all C’s. Larger the diamond carat, more the value. In essence, a carat of the diamond is a weight measure that is universally accepted. One carat (1.00ct) diamond is equivalent to 0.2 grams. More the carats, larger the diamond, making it the most prominent of all C’s. However, it shouldn’t be misconstrued with the size of a diamond. A size of a diamond is measured millimetres taking in the diameter of the diamond surface and notgrams. The word “carat” is derived from Carob seeds, each seed so homogenous in size and weight that they were used as a measure to counterweight in balancing scales in primitive time. Carat as a metric got standardised in 1907 and is globally accepted by countries around the globe. Today carat isa standard point of reference when looking at the certificate of a diamond, regardless of institute certifying it. Another way of expressing a carat unit is by means of points, where one carat is equivalent to 100 points. So say a diamond of 0.30ct is also referred to as a 30 point diamond. When a crude diamond is cut and polished it loses about 2/3 of its total carat weight, making diamond so rare and expensive. A diamond cutter’s talent lies in extracting and maximising carat weight of a diamond from the rough mining. As a rule of thumb, rarer a diamond, more expensive it is. Finding bigger rough diamonds that can be cut and crafted into larger carats of diamonds are quite rare, making them exponentially expensive. This is the reason why a single 2 carat diamond is a lot more costly than cost of two 1 carat diamonds added together. As said before the carat weight is not as same as the size of a diamond. Every diamond has an average millimetre size per carat so one can visually measure the size of a diamond. These measurements are a standard norm that consider not only the length and the width but also the depth of a diamond. Ever wondered why 1.00ct round diamond looks bigger than 1.00ct princess cut or other fancy cut diamond like asscher cut? 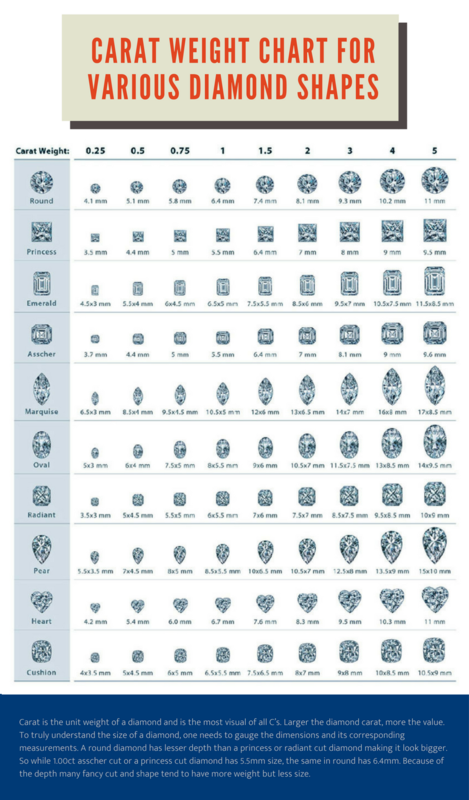 To truly understand the size of a diamond, one needs to gauge the dimensions and its corresponding measurements. A round diamond has lesser depth than a princess or radiant cut diamond making it look bigger. So while 1.00ct asscher cut or a princess cut diamond has 5.5mm size, the same in round has 6.4mm. Because of the depth many fancy cut and shape tend to have more weight but less size. Cut of the diamond is another factor that affects the size of a diamond. Deeper the cut, smaller the size of the diamond. So even a 0.95ct with deep cut look smaller than 0.80ct with a shallow cut. How can you discern whether the cut is shallow or deep? While you consider the carat and millimetre, it is equally important to look at the length and width ratio of a diamond. Larger the carat weight, rarer the diamond and hence costlier it is. Prices of the diamonds increases exponentially with the increase in the carat weight. There are what we commonly recognise as critical weights: 0.30ct, 0.40ct, 0.50ct, 0.70ct, 0.90ct 1.00ct, 1.50ct, 2.00ct, 3.00ct, 4.00ct, 5.00ct, 10.00ct (though is rare to find diamonds from above 3.00ct). Once the carat reaches these critical weights the price leaps. It is there for recommended buying tip to always buy a diamond in between these weights. A 5 to 10% difference in the carat weight can hardly be noticed. But diamond producer and dealers are already aware of this trick to the trade and charge accordingly. The best way to understand this exponential pricing model is to consider price difference per carat. Say for eg: 1.00ct diamond is priced at $5000 and 3.00ct is for $60,000. Now if we take the price-per-carat, 1.00ct still remains $5000 where as that of 3.00ct is now $20,000. Can you see the bump? It is a trend amongst buyers to consider carat above other three C’s. Most of the times to fit in the budget people let go of cut, clarity and color in favour of carat. But if you compromise too much on other C’s like cut and clarity, the reflection of light is arrested which might end up reducing the fiery sparkle that diamonds are most known for. Though carat is important, it isn’t everything. Here are a few hacks to get the best value in your budget. - Balance all 4C’s instead of just considering carat only. - Choose a well cut diamond, which has less depth and more spread making it look larger in size. - If you want bigger looking diamond go for shapes that give maximum surface spread in the same carat weight.